When England step out onto the pitch on the 18th of June against Algeria – they represent the 11 best footballers this country has to offer. 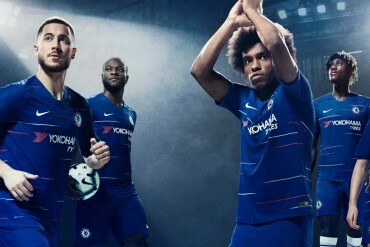 However, there will be 6 other players on the pitch who will also have proven themselves the best in England. John & the winning team of kids! 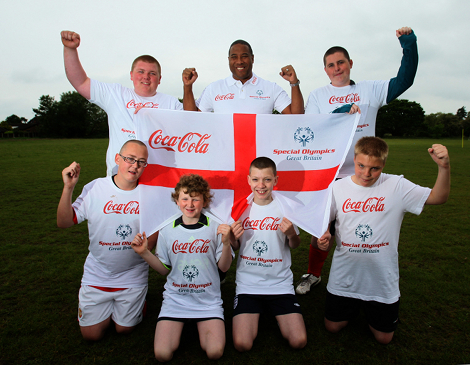 Coca-Cola, in association with Special Olympics Great Britain have given 6 youngsters, 5 of whom are from the Merseyside area, the unique opportunity to be England™s official Flag Bearers for the England v Algeria match at the Green Point Stadium in Cape Town on 18th June. This once in a life time experience will involve the youngsters leading out the England team carrying the St George™s flag ahead of Kick-Off. The 6 youngsters were chosen through the Special Olympics™ Unified Football Programme, where athletes with and without intellectual disabilities play together in 7-a-side teams. At the launch of the event earlier in the week, Footy-Boots.com was given the opportunity to chat all things England with legendary Liverpool and Watford winger John Barnes, who was compering the event! 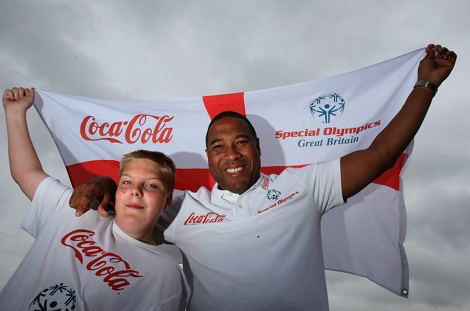 John Barnes and Alec Barry, one of the Flag Carriers for the Algeria game! FB: So John, as someone who’s walked out onto the pitch of a World Cup game as part of the England set-up, can you think of any great prize for these youngsters? JB: No! it’s something that’s so special. Football is a sport that brings joy and excitement but it’s also a unifying sport that brings everyone together in a very positive way. The World Cup really represents all these things about football, and going to the World Cup is the greatest feeling in the world – it’s great for these kids to be able to experience that whhether they have learning difficulties or not! FB: With England bidding to host World Cups, and with London hosting the Olympics in 2012 – how important are scheme like this one to British Sport? Very important! Not just for developing and encouraging people to play, but having companies like Coca-Cola involved and getting everyone involved is actually part of FIFA criteria if you want to host a World Cup. Part of showing that as a country, you have a whole footballing family; with everyone involved – from the Premiership to Women’s football to helping kids like this have access to national game. FB: Looking at the England squad now – as a winger yourself, you’ll have a better idea than most what responsibilities a wide player has. How would you play England’s wide players? JB: If it were up to me, I’d have one ‘full’ winger like Aaron Lennon, and another who is more of more dedicated midfielder. Firstly, we’ve got Ashley Cole who is a real threat going forward and we should encourage that. By having someone who’s not trying to nip in behind defenders all the time, it means Cole can get forward without leaving a big gap in the defence. 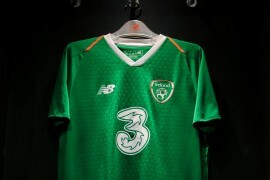 And at international level many teams like to really pack the midfield – as we saw against Mexico. So if you have two wingers going forward all time, your centre-midfield isn’t going to get any time on the ball. So I’d look at players live Lennon and Wright-Philips on the right hand side, and maybe someone like Milner or Gerrard on the left to let Cole go forward. FB: And how do you rate England’s chances this summer? JB: We’ve got a good chance. We’ve got good players, a good group and Capello has them playing well. I mean, can we beat the big teams in the tournament? Yes! Can they beat us? Again, yes! So we’ve got to be positive, and the players are playing have belief in the Manager and are playing positive. FB: Even for the biggest players in the country who play under the best managers in the world, week-in, week-out, why do you think a good international manager makes such a difference? Well, a manager like Capello gives everyone something to look up to. He’s gotten really involved with a the FA and done positive things. Since becoming manager he’s given the fans, the press and the players someone respectable to feel positive about. Thanks to Coca-Cola and SOGB for the chance to learn a bit more about the scheme – and congratulations to all the kids involved in tournament. We’ll be looking out for them on the pitch in Green Point on June 18th!